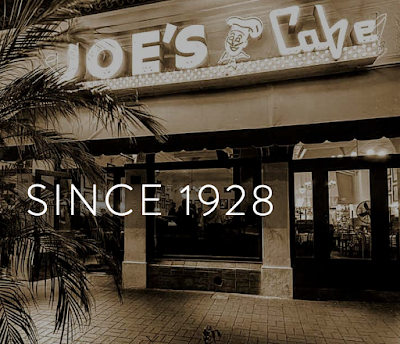 If you're a Santa Barbara local, you have enjoyed an Omaha at Joe's Cafe. And even if you're just visiting, you should. I wish I was eating an Omaha right now, but I'm in Phoenix. When I lived in Santa Barbara, back in the '80s, I went there often. And since Santa Barbara is a touristy kind of place, I made a point of asking the locals where to go to eat, and Joe's Cafe was at the top of the list. • Park in a parking garage, or a lot. State Street, like all of Santa Barbara, is a beautiful place to walk. Joe's is on the southeast corner of State and Cota, and there is a lot of parking to the east and west of State Street. If it were me, I would park far enough away so that I could take a nice stroll on State Street, one of the most beautiful places on earth. • Order an Omaha. Unless, of course, you're vegan. It's an open-faced sandwich with thick slices of prime rib. You eat it with a knife and fork. It's what local order. The last time I went there, the menu didn't give any description, just Omaha. Just say, *Omaha, medium* or well done, or rare, as you prefer. Yes, you can order anything you want, just don't tell me, it will break my heart! • If you order a drink, only have one, and take your time. Unless the bartenders' wrists have gotten weak in recent years, Joe's drinks have always been way too strong. I suppose in the 1950s, it would have been funny to be "over served", but not now. So, go get an Omaha! I'm jealous.